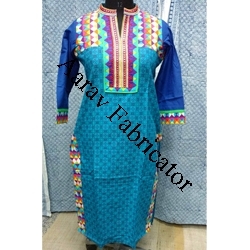 Aarav Fabricator is wholesalers and manufacturers dealing in different designs and styles cotton Jaipuri kurtis. Jaipuri kurtis are comfortable to wear, as they are mostly made of 100% high quality cotton fabric. So, they are the favourites of one and all. Keeping this in mind, unity has designed these cotton kurtis with some unique designs. These cotton kurtis come with Jaipuri Kurtis, embroidery work, angarakha style, and beautiful hand block prints. Here, you'll also find cotton kurtis with floral designs, mirror work and zari patchwork which add elegance to these dresses. They can be worn with jeans and leggings and serve as the ideal semi-formal wear. We are Cotton Kurtis Manufacturer latest or traditional designer Ladies kurtis, Beach Kurtis, Designer work Kurtis, fancy kurtis, Hand Block Print Kurti, cotton kurtis, Ladies Block Printed Tunics, embroidery work Kurti, angarakha style Kurti, fancy ladies kurtis, chikan embroidered Kurti, hand block prints Kurti and long top tunics with any Sizes ( Small, Medium, Large, XL). 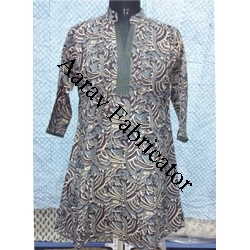 cotton Readymade kurtis manufacturer, cotton Readymade kurtis wholesaler, cotton Readymade kurtis supplier in Jaipur Rajasthan, Delhi, Mumbai, Ahmadabad, India, Japan, South Aferica, U.S.A., Dubai, Saudi Arab, UAE, oman, Gulf Countries. Engaged as a manufacturer and wholesaler, we are providing Ladies Casual Wear Kurta, Designer Wear Long Kurta and Short Kurta. Enhance the look of the wearer, these kurtas are designed and developed with the machinery under the guidance of designers. Moreover, to suit the demands of esteemed clients, we offer these kurtas in various designs and patterns. The Ladies Jaipuri Kurtis we offer are available in a wide range of patterns. We provide Ladies Jaipuri Kurtis that speak for their distinctive style and tradition as Jaipuri Kurti Wholesaler. Keeping in mind the latest fashion trends, we are offering these Jaipuri Cotton Kurtis as per the changing preferences of ladies. Our valuable clients can purchase Jaipuri Kurtis assortment at affordable rates. We offer our clients exclusively designed Cotton Anarkali Kurtis. The offered Embroidered Anarkali range is designed by our creative designers using premium quality threads and fabrics in compliance with the latest market trends and attractive color-combination with Charming Look. anarkali suits are available in various magnificent floral elegant designs and patterns which render a unique look to any lady's personality. Our clients can avail this range from us in different Skin-friendly colors, aesthetic designs and sizes, as per their specific preferences. we are engaged in offering Casual Wear Short Kurtis for our clients. They are designed and crafted and render a Perfect look to the wearer. These short kurtis are made from high quality fabric materials with available in various patterns, colors, designs, sizes and textures. Our offered Rajasthani kurtis are highly popular among our clients due to their attractive designs and colors. Moreover, these offered kurtas and kurtis are designed by highly skilled professionals and represent Rajasthani art and culture perfectly. Manufacturer and Wholesaler of a wide range of products which include Hand Block Printed Cotton Traditional Kurtis such as Block Printed Ethnic Kurtis, Hand Block Print Kurtis, Bagru Printed Kurti, Indigo Hand Block Printed Kurtis and Dabu Printed Kurti. Cotton Kurtis Manufacturer Jaipur presents a various categories of ladies kurtis tops in market competitive price range. we presents a wide range of the economic cheapest designer kurtis online shopping classifieds and displayed by categories to help our buyers to find our range of kurtis online store in numerous kurtis designs through the various categories. 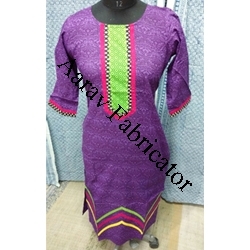 Our clients trust us for the manufacturing, supplying and exporting of ladies readymade garments such as ladies cotton kurtis, Hand Block Print ladies Kurti. We provide a wide range of Readymade cotton kurtis at very economical prices. We also make custom kurtis in bulk orders as per clients requirement in all sizes, colours & pattern at market competitive price. Cotton Kurtis is the most comfortable and light weighted outfit for women. 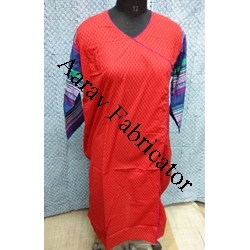 Keeping this in mind Aarav Fabricators offers a unique collection and is one of the renowned cotton kurti manufacturers in Rajasthan. We are dealing with unique and exquisite cotton kurti designs adding a flare to a style statement. All our cotton kurtis accompany Jaipuri Kurtis, weaving work, angarakha style, and lovely hand square prints. Here, you'll likewise find cotton kurtis with botanical plans, reflect work and zari interwoven which add style to these dresses. They can be worn with pants and tights and fill in as the perfect semi-formal wear. Jaipur - The Pink City, city of colors, traditions and royal legacy. 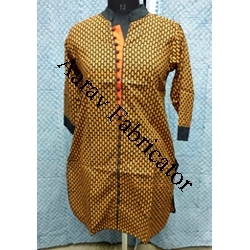 Aarav Fabricators are famous manufactures dealing in 100% pure cotton fabrics dealing a fine range of jaipuri kurti wholesale work. As Kurtis are women's favorite and most comfortable attire we provide a wide variety of exquisite collection in various design and patterns. Enhance your look with these stunning kurtis that are planned and created with the apparatus under the direction of originators. Not to forget, our exclusive Jaipur Kurtis are specially created and designed to suit the needs and requirement of our worthy clients and lovely customers. Browse through our collection and pick the once that suits best!